The CW’s popular show Hart of Dixie returns tonight with a new episode called, “Lovesick Blues.” On last week’s episode when George’s parents came to visit, they were thrown when they met his new girlfriend, Tansy, and George’s mother devised a plan that forces George and Zoe to address their feelings for one another. Lemon discovered that Brick had a secret girlfriend and was shocked when she found out who it was. Meanwhile, Annabeth was smitten with a charming British visitor to the town, but Lavon grew suspicious of him and is determined to uncover his real identity. Did you watch last week’s episode? We did and we recapped it HERE for you! On tonight’s show When Zoe (Rachel Bilson) is alerted by the Health Department about a flu epidemic heading towards BlueBell, she is forced to put the town on lockdown. Because of the quarantine, Wade (Wilson Bethel) is forced to stay at his ex-girlfriends house causing Zoe to become jealous. Lemon’s (Jaime King) plan for the perfect night with Walt (guest star Rich McDonald, “Generation Kill”) goes awry when she begins to feel under the weather. Meanwhile, George (Scott Porter) finds himself roped into directing Lavon’s (Cress Williams) tourism commercial about BlueBell’s small-town charm, but it seems Lavon, is more preoccupied with his co-star than his commercial. be sure to tune in for our live coverage of CW’s Hart of Dixie at 8:00 PM EST! 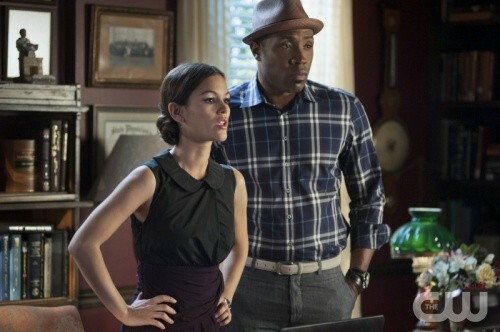 HART OF DIXIE RECAP: SEASON 2 EPSIODE 13 HERE!